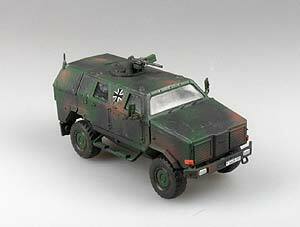 The Dingo 1 is based on the reliable U1550L Unimog chassis and was brought into German Bundeswehr in the year 2000. It is built of 5 seperate compartments including chassis, crew compartment, engine, stowage compartment and mine deflector. The crew of 5 soldiers is safe within it's compartment from infantry weapons up to 7.62mm and blasts up to 4kg TNT. The Dingo 1 has a weaponstation on the roof which can be fitted with a 7.62mm MG3 or 40mm grenadelauncher. Additionally it has unarmored stowage compartment at the end for a maximum payload of 1.8t. With the engine of 166kW the Dingo can achieve a top speed of around 100km/h. It is 5.23m long, 2.31 wide and 2.38m high. The 147 produced Dingo 1 are mainly used in missions outside Germany just as KFOR and ISAF to give the crews the best possible protection. Especially in Afghanistan it proved several times to be reliable on attacks by carbombs and mines and is still in use there.